Peregrinação is a Portuguese literary work that was a bestseller in its time and its popularity has not waned even in the 21st century, given the number of languages into which the work has been translated. The book contains the memoirs of Fernão Mendes Pinto, expounding the details of his travels and consequently his life. Originally translated as Pilgrimage, the latest English translation is titled Peregrination, which has been deemed to be much more appropriate to the subject matter presented. Fernão Mendes Pinto was born in Montemor-o-Velho, Portugal in either 1509 or 1510. He went from being a servant boy to being captured by pirates as a ship boy. He later left Portugal to join the Portuguese India Armadas but not before serving under Francisco de Faria, a knight of Santiago and Jorge de Lencastre, a master of the Order of Santiago. He undertook numerous voyages: through the region of the Red Sea, from the coast of Africa to the Persian Gulf and from India he travelled to Siam, Sumatra, China and Japan. Fernão Mendes Pinto was a sailor, soldier, slave, ambassador and priest, all in one lifetime. He returned to Portugal in 1558 and married Maria Correia Barreto and settled down at a farm in Pragal, where he died on 8th July, 1583. His Peregrinação, which he commenced writing in 1569, was not published till 1614 by Friar Belchior Faria. 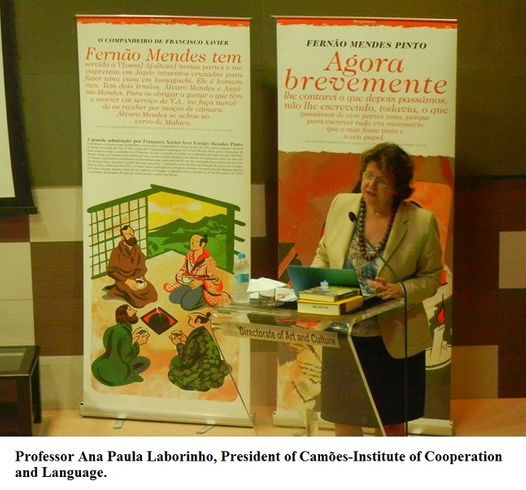 Celebrating the 400th anniversary of Peregrinação, Professor Dr Ana Paula Laborinho, president of Camões -Institute for Cooperation and Language, delivered an engaging closing lecture on the significance of this prominent piece of Portuguese literature that has had a larger readership than the epic poem, The Lusiads (Os Lusíadas), by Luís Vaz de Camões. She is one of the leading research scholars on Fernão Mendes Pinto. ‘I’m not a historian. I read this book from the point of view of literature,’ says Professor Laborinho, ‘but researchers have found many things in this book are true, for example, the episode on the war between Siam (Thailand) and Burma (Myanmar) is now recognised to be the first known description of the war’ The book, nonetheless, was not meant to be a chronicle. The focus was his life and the sins he had committed. This book could be considered the first literary writing in Portuguese. Fernão Mendes Pinto was not a literary scholar and yet he managed to turn the book into an engrossing reading. He used devices that were ahead of his times such as realism on the lines of the Aristotelian theory of mimesis: art imitates reality. ‘Fiction is not complete imagination. 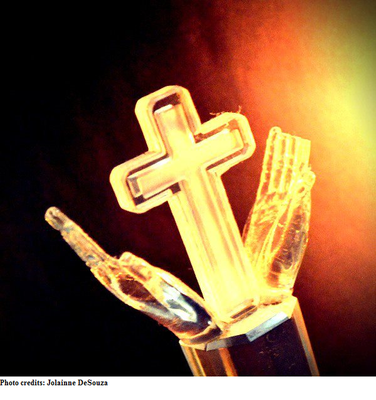 It is based on something that has happened it reality,’ says Professor Laborinho. There are other travel narratives of the time but Peregrinação stands out among them. The writer wishes his readers to know of his sinful life and how he changed his path after meeting St Francis Xavier. All his writing is directed towards this event, which is considered the most important. With the prowess of a modern author, he presents events that could have occurred at the beginning of the novel, at the end, in order to emphasise his spiritual conversion. The first part of the book concentrates on the wayward life he has led as a soldier and sailor. Fernão Mendes Pinto includes another character in this, called Antonio Faria, who is co-conspirator in these unsavoury deeds. All the adventures of the first section lead to the middle, which is the crucial part, the pilgrimage. Therefore, Pilgrimage as the initial translation was called, is not suitable as a title. Peregrination makes more sense as it means a meandering journey. During this middle phase it is his journey through China, where he was lost, poor and he suffered terribly. ‘Meeting St Francis Xavier changes his life. We have a lot of information that the two were friends,’ says Professor Laborinho. The message he tries to convey is that his conversion should be an example to others, to inspire his readers to embrace a life of spiritual renewal. After being part of the throng to receive the incorrupt body of St Francis Xavier, Fernão Mendes Pinto was influenced to join the Society of Jesus. However, following the three years as a priest, he detached himself from the religious order. Even before being printed the book was extensively perused by the Jesuits who wanted more information on St Francis Xavier. Fernão Mendes Pinto is also famous for the letter he wrote as a Jesuit, about the death of the saint, which has been translated into Spanish, French and Italian. The book was published long after his death and it may have been reworked, especially the arrangement of the chapters, and certain portions have been deleted. It seems strange that he would not mention his time as a Jesuit priest in the book. ‘It could be because he wanted to keep good relations with the Jesuits. It could have been something he decided on his own,’ Professor Laborinho reasons. The novel was published as the same time as the picaresque novel, Don Quixote, by Cervantes. 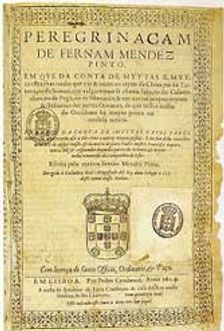 The Portuguese were under Spanish stronghold at this time and the novel may have been altered in its essence owing to the influence of Don Quixote .The book was translated first into Spanish and then into German, French, English and Low German. The novel changed slightly in its interpretation with each translation. It became more a book of adventure and imagination, whereas the author had conceived of it as spiritual narrative. From the 17th to the 20th century, the book was read as a satirical novel or as an adventure novel. It is the ability of being read in so many ways that makes Peregrinação a fascinating book. It is a book that can be added easily to the list of world famous literature.